Faramarz Fekri received the B.Sc. and M.Sc. degrees from Sharif University of Technology, Tehran, Iran. Before coming to Georgia Tech, he was with the Telecommunication Research Laboratories (TRLabs) , Calgary, Canada. There, he worked on Multicarrier Direct Sequence Spread Spectrum for Mobile Communication systems and was a recipient of the TRLabs' distinction award. In Fall of 1996, he started his Ph.D. studies at Georgia Tech. 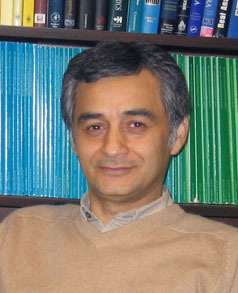 After receiving his Ph.D. degree in Summer 2000, Dr. Fekri joined to the faculty of the School of ECE at Georgia Tech, where he is now a full professor. He is a member of the Center for Signal and Information Processing (CSIP), the Center for Energy and Geo Processing (CeGP), the Center for The Machine Learning at Georgia Tech, and the Georgia Tech Information Security Center (GTISC). He was also affiliated with the Georgia Tech Broadband Institute (GTBI). Prof. Fekri is the founder of the SPC Research Lab that has a multidisciplinary flavor working in three intertwined areas of Sensing, Processing, and Communications. In particular, he applies signal processing, statistics and information theory to fundamental research problems in biology (e.g., molecular communications, biomarker sensing, disease detection, neural computing), social computing (e.g., trust and recommender systems, truth discovery, attack detection), and wireless communications (e.g., coding, compression, approximate computing). Dr. Fekri serves on the editorial board of the IEEE Transactions on Molecular, Biological, and Multi-Scale Communications, and on both the Executive and Technical Program Committees of several IEEE conferences. In the past, he served on the editorial board of IEEE Transactions on Communications, and the Elsevier Journal on PHYCOM. Dr. Fekri has received several prestigious awards, including the Outstanding Junior Faculty Member Award of the School of ECE, Southeastern Center for Electrical Engineering Education (SCEEE) Young Faculty Development Award, National Science Foundation CAREER Award, the Cutting Edge Research Award (co-recipient) from the College of Engineering, and Best Ph.D. Thesis Award of the Georgia Institute of Technology chapter of Sigma Xi. He is an IEEE Fellow.